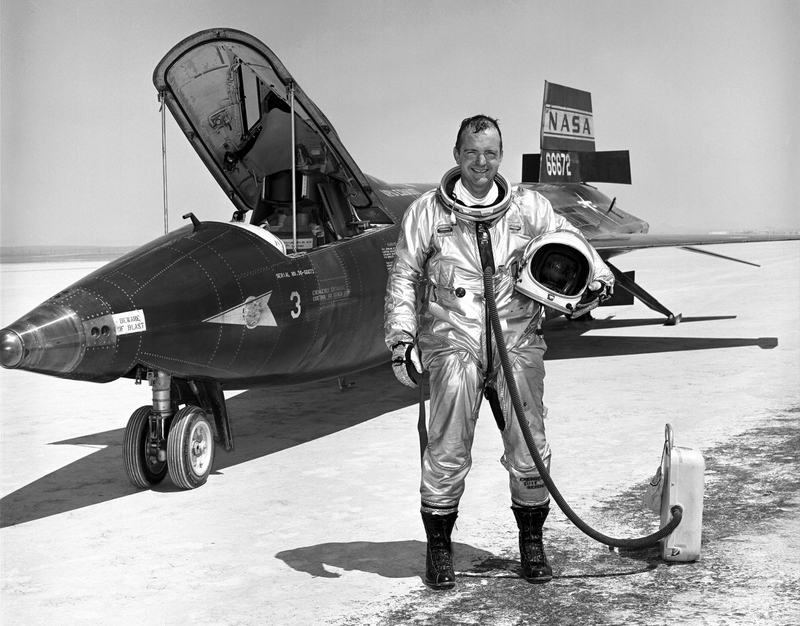 The X-15 is a fascinating project in NASA and aeronautic engineering history. Running from 1958 to 1968 this plane couldn't take off: it was dropped from under the wing of a modified B-52 bomber. You can see it below, the black craft under the far wing. A single occupant craft, the bulk of the X-15 was given over to the powerplant. Early flights used the existing XLR11 rocket, an on-and-burn engine that gave just shy of 7 kilonewtons (kN) from its four combustion chambers. Once throttling technology had been perfected, later flights used the XLR99 engine. This rocket had some punch. From its single combustion chamber it gave 254 kN of thrust at a variable throttle of 50% to 100%. Here's the XLR99 mounted in the tail of the X-15. Early missions with the tiny rocket proved out the craft concept, later missions set and met research goals, making a handful of new astronauts and breaking some speed and height records along the way. You know, Science! This post isn't about that. This post is about a wee suitcase looking thing. The pilot above is Bill Dana. He's standing on a lakebed landing strip somewhere near Edwards Air Force Base[^1] in his XMC-2 pressure suit, helmet underarm. Behind him, the 66672, which would later be lost on flight 3-65-97 along with pilot Michael Adams. What's that thing beside Dana on the ground, connected by a hose into his suit? Pressure suits design vary. The basic idea is this: keep the human separated from nothingness and all the complications involved with nothingness. We burn when exposed to too much infrared radiation, evolved to shed our own heat through convection and evaporation inside an atmosphere and swell up real big when exposed to low-pressure environments. 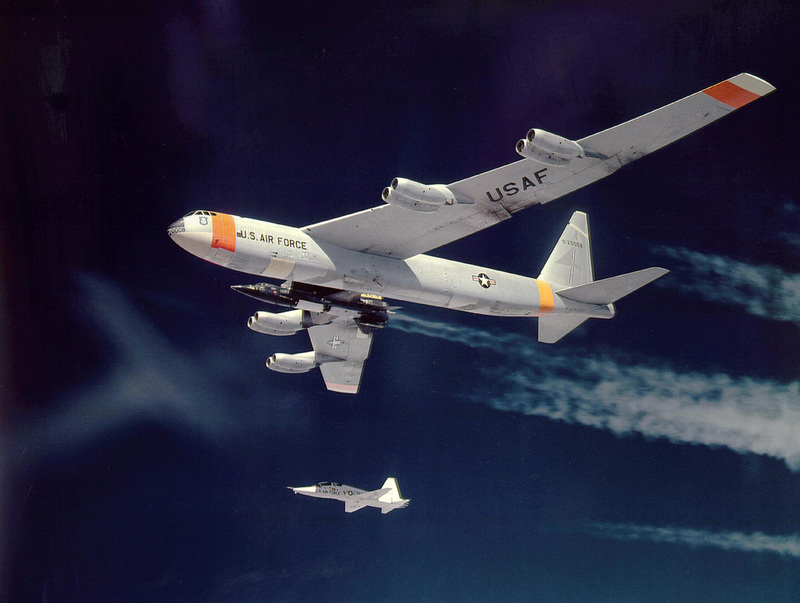 The X-15 itself solved two of those problems: the canopy was designed to block IR and was pressurized with nitrogen. Shedding body heat was resolved by running coolant through an inner layer of the suit, hooked up along with the oxygen provided by the craft's life-support system[1:1]. If you don't know US Geography—or aren't up your semi-obscure but totally important for the history of global aeronautics research US Air Force bases—Edwards is located is in Southern California, the hard desert part. Here's what it looks like from satellite imagery. The X-15 pilots were obligated to sit inside the aircraft to be hooked into its life-support system and this wouldn't last for very long after landing. Extraction from the dry lakebed could take a while, depending on how far off the mission's mark the pilot landed. It could also take a while for pilots to be loaded into the X-15 and the X-15 itself to be tucked up under the B-52's wing. This means, if you're an X-15 pilot, you're doing a lot of waiting around in an insulating suit in the beating desert sun. This is where that suitcase looking thing comes in. It's a gas-powered portable A/C unit! Pilots reported that they didn't stay cool while that thing was running, but neither did they get heat stroke. It runs the same system as the X-15 did but could be carried around as needed. Did an okay job, I guess you could say.